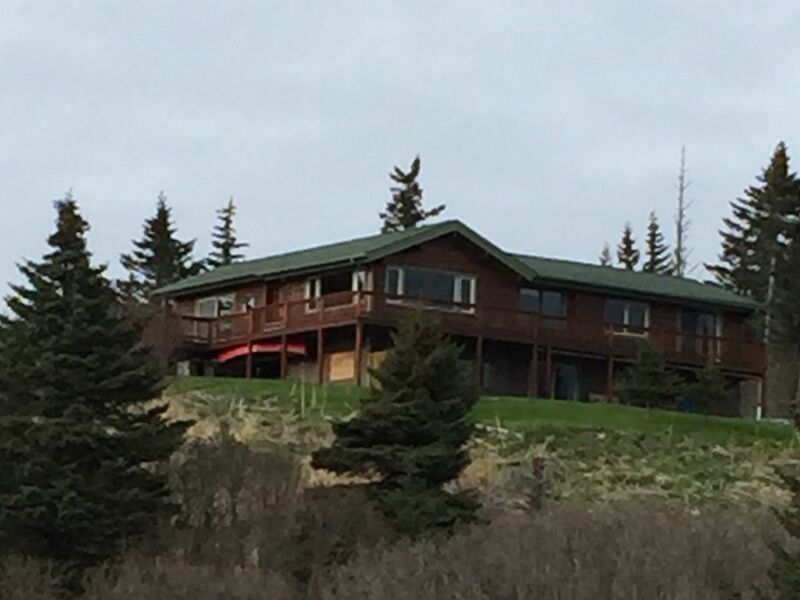 Kenai Peninsula Secluded Retreat with Spectacular View! This home sits on a site selected as a homestead over 100 years ago. The view is simply mesmerizing. Gaze across Cook inlet at Illiamna volcano, Saint Augustine volcano and on a clear day all the way to Mount Douglas. In the foreground you gaze over the Stariski Creek valley. Located at the end of a private driveway you will find a large plush and cozy cabin perfect for enjoying Alaska in all seasons. Located a few miles north of Anchor Point we are about twenty minutes north of Homer or fifteen minutes south of Ninilchick. Choose from countless options for salmon and halibut fishing in either direction. This is a retreat from which you can embark on daily excursions to go fishing, wildlife viewing, hiking, clamming, or flight seeing, Rainy days are perfect to visit the Islands and Oceans Visitor Center, the Pratt Museum or meander the shops and art galleries of Homer. If you want a break from it all this is a fabulous place to sit and read a book, write a book, paint, grill salmon or halibut and contemplate life. On a clear day dinner on the deck is unforgettable. Bald eagles frequently are soaring overhead. Moose are occasional visitors to the yard. Other wildlife sighted from the house include black bear, ermine, river and sea otters, harlequin ducks, gulls, yellowlegs, belted kingfishers, loons, harbor seals, murres, oldsquaw, scoters, Steller's jays, chickadees, kinglets, warblers. Our all cedar home features 4 bedrooms, 1 -full bath, 1- 3/4 bath and 1- 1/2 bath. In season there is an outside shower that is great! Full kitchen, Living room with wood stove, dining room, and den area with Toyo stove. Hot tub with an incredible view may be available. We have been coming to Alaska for thirty years to visit family and enjoy the spectacular scenery and wildlife. Our kids talk about our time in Alaska all year and look forward all winter to returning. We love to spend time in Alaska every year. The views, the wildlife, and the experiences create memories to last a lifetime. This house provides solitude and a million dollar view. Good proximity to fishing, hiking, and the charm of Homer. Far enough off the paved roads to be quiet and peaceful, yet close enough to be easily accessible. Clamming at low tide. Watch the fishing boats reel in the fish right out in front. Watch the ships pass to and from Anchorage in the distance. Some of the best King salmon fishing on the Kenai Peninsula is right out front. Patio table with umbrella and seating for five. Spectacular setting and a very comfortable home. End of road privacy. We saw lots of eagles and a moose. We are always happy to hear that our guests enjoy the property as much as we do. Great that you were able to enjoy the wildlife! Thanks for sharing your experience! Thank you Derek for your kind review. We are thrilled to hear you enjoyed your stay and that you were fortunate to see all the wildlife. It truly is a special place and it's wonderful to be able to share it with others. We hope to see you back again sometime in the future. Very nice cabin/house with great location. View is breathtaking! My family and I spent a week here. We had lots of space with a large family area for entertainment. The view was spectacular and the property was far enough off the highway to feel secluded! We will definitely be returning. The cabin is very nice. View is specatacular. Great location as a base for Halibut fishing and other activities on the Kenau peninsula. Very comfortable and clean and well furnished and supplied. Truly a home away from home sort of deal. The views are spectacular! great wrap around deck overlooking the ocean. even better in person. the location was key - fishing in anchor point and homer. not a bad drive at all to homer. house was conveniently stocked with condiments and other staples from past guests- we love that. super clean and well equipped with towels, linens, toiletries. owners are super responsive and easy breezy to rent from. house has a great downstairs playroom and bedroom - great for teenagers. we would love to stay again! hidden gem! relaxing leisire with beautiful views! The cabin has everything you need for a relaxing weekend get away! We enjoyed our 4th of July weekend there and were very happy with the accomodations, views and relaxing environment.